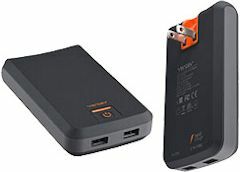 Ventev has powered up its collection of battery chargers for your portable devices (see earlier post). These are clean and smart designs, featuring a slate gray look with signature orange accents. For full power when traveling, the Ventev Powercell 6000+ Combination Charger is a 6000mAh battery that provides up to 25 hours of additional talk time for your mobile phone. It's around 4 1/2 x 2 3/4 x 7/8 inches. It has two USB outlets, so you can charge two devices at once, with one port providing 2.1A for rapid charge and tablets. And it's a wall charger, with integrated folding AC prongs, so you can recharge it at any convenient wall outlet. It's particularly handy on longer trips -- you can carry it along during the day as a power reserve that can be shared by a group, and then plug it in to the wall at night to directly power (and recharge) multiple devices as you use them. The Powercell 6000+ Charger is available for around $67. For day trips, the Ventev Powercell 3015 Battery Charger is an impressively thin and light design. At around 3 7/8 x 2 1/8 x 3/8 inches it's barely noticeable in a bag, but its 3000mAh battery still provides an extra 12.5 hours of talk time. 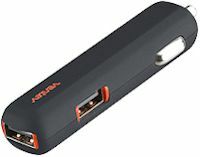 It has one 1.5A USB port for charging phones, and a mini-USB port for recharging. The Powercell 3015 Charger is available for around $35. And for your car, the Ventev Dashport r2240 Dual USB Car Charger delivers two 2.4A USB ports, to even charge two tablets simultaneously. The compact design has one USB port on the end, and another on the side. And the ports are LED-illuminated so you can find them in low light. The Dashport r2240 Dual Car Charger is available for around $29. I'm also a big fan of Ventev ChargeSync Cables for charging and syncing from USB to your devices. They're flat and tangle-resistant, and colorful so they're easier to identify when you need the right Apple, Lightning, or microUSB connection. The ChargeSync cables are available in a variety of colors and 6 or 3.3 feet (1 meter) lengths for around $15 to $25. Jabra has nice options if you're interested in lightweight wireless headphones (the Jabra Move Wireless - see previous post), and a similar answer for Bluetooth phone headsets -- the Jabra Stealth headset. The Stealth is a particularly small and discreet design -- basically a thin rod that weighs about a quarter ounce. The small size does not skimp on sound quality. Its Jabra sound enhancement technologies include Noise Blackout and dual microphones to reduce background noise, and HD voice for high definition sound quality. You can fit the Stealth in your ear with different ear gels, with and without a flange to anchor in your ear folds, or add an optional earhook if desired for additional support. In addition to the power and call answer/end buttons, smartphone voice control has become so important that the Stealth also adds a dedicated Voice button on the side for voice dialing and commands, using Apple's Siri or Google Now. The headset provides voice guided instructions for status and for pairing, or use NFC. There's also a Jabra Assist app for Android and iOS that provides GPS tracking of the headset, pairing assistance, and headset battery status. It charges in about two hours to provide up to 6 hours of talk time, or 10 days of standby. The small but impressively capable Jabra Stealth is available for around $99. We are exposed to so much noise -- in the city, or on a plane, or at a concert. For our own sanity (and for our long-term hearing), it's helpful to wear some kind of earplugs to reduce the clatter and pain. But soft plugs or even hearing protection earplugs indiscriminately chop down the sound level, dulling your listening experience. The Doppler Labs DUBS Acoustic Filters take another approach, reducing the volume without muffling the sound. The trick is to use dynamic attenuation with high and low pass filters to target specific frequencies, while still providing an overall 12dB Noise Reduction Rating (NRR) to protect your ears. The design of the DUBS is also friendly, with a soft tip that fits in your ear canal and the base that nestles flush in your outer ear, so you don't look like you have antennas sticking out of the sides of your head. As a result, you can protect your ears in comfort, even at ridiculously noisy events or concerts -- and still enjoy and appreciate the experience. You also can hear your own voice more naturally. The DUBS Acoustic Filters come in one size, designed to fit most adults ages 16 and up. They're available for around $25, in teal, blue, pink, or white accents. MPOWERD has expanded its line of Luci Solar Lanterns, designed to bring affordable and clean solar lighting to remote places and people (see earlier post). These are a simple and sensible concept -- Start with a flat disc with solar panels on one side with a battery to store power, and LED lights on the other. Then add an inflatable PVC enclosure that expands into a free-standing cylinder that can serve as a task light, flashlight, or diffused lantern. The result is an all-in-one and maintenance-free light that is easy to pack (when deflated), and lightweight and waterproof for travel (it also floats). Plus the Luci lanterns are fun, with options for different colored lights and blinking. The flashing mode even acts as a 1 second timer. These are controlled by a simple on/off push button in the center of the top. Just press repeatedly to cycle between the light modes. The latest development is the new Luci EMRG model, with the price driven down under $10 to be even more affordable and accessible -- It's a multi-intensity flashlight with a blinking red emergency flasher mode. Its 4 LED lights provide up to 25 lumens to light a 100 sq. ft. (10 x 10) area. It's compact at 2.6 ounces, and now available for $9.99. The Luci Original for $14.99 weighs 4 ounces and collapses to one inch thin. It provides up to 50 lumens to light a 150 sq. ft. area. 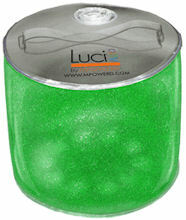 The Luci Outdoor for $14.99 repackages the Luci Original plus a clear top for outdoor use. The Luci Lux for $19.99 adds a frosted finish for a warm glow. And the colorful Luci Aura for $24.99 offers seven colors plus white, with a color cycling mode. The Luci lanterns charge in about 8 hours in direct sunlight, but also can be charged in indirect and even indoor lighting (albeit in more time). It should hold a charge for about three months, and be usable for at least several years even with heavy use. More power! We have all these wonderful electronic gadgets, but they keep needing to be recharged. So we end up with an ugly profusion of adapters hanging from outlets all around the house -- in the kitchen, den, living room, and even the bedroom. A better answer is to get rid of all those adapters, and integrate USB power into your existing AC outlets -- with the NewerTech Power2U AC/USB Wall Outlets. These are dual-socket AC wall outlets that fit into a standard 16 cubic inch electrical/wall box. Plus they have two integrated USB ports to power and charge your devices. The USB ports are protected by spring-loaded safety shutters that turn power off when the cable is removed, and have smart circuitry that only outputs the charging power required by the attached device. NewerTech Power2U Wall Outlets are available for 15A (typical residental) or 20A circuits (office, kitchen/garage) for $17 and $20 respectively, in white, black, ivory, and light almond. Entries posted to Manifest Tech Blog in February 2015, listed from oldest to newest.